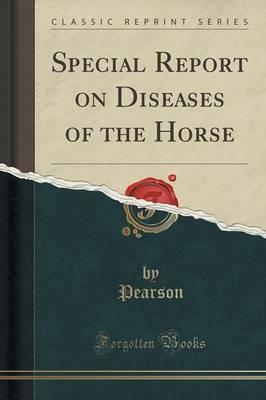 Excerpt from Special Report on Diseases of the Horse Sir: I have the honor to transmit herewith a copy of the Special Report on Diseases of the Horse prepared for reprinting in accordance with the following resolution, approved March 4, 1907: Resolved by the Senate and House of Representatives of the United States of America in Congress assembled, That there be printed and bound in cloth two hundred and fifty thousand copies of the special report on diseases of horses, with accompanying illustrations, the same to be first revised and brought to date under the supervision of the Secretary of Agriculture, one hundred and seventy-five thousand for the use of the House of Representatives, sixty thousand for the use of the Senate, and fifteen thousand for the use of the Department of Agriculture. As the work was thoroughly revised in 1903, it has been found necessary to make only at slight revision at this time. A brief chapter on "Osteoporosis, or bighead," by Dr. John R. Mohler, Chief of the Pathological Division of this Bureau, has been added. This report was first issued in 1890 and was at once accorded a hearty reception by the horse owners of the country. The limited edition that the Department was able to publish was very soon exhausted, and the demand was then turned upon Members of Congress. As a result of the continuous demand Congress has ordered reprints from time to time until the total editions, including that provided for by the above resolution, approximate 900,000 copies. About the Publisher Forgotten Books publishes hundreds of thousands of rare and classic books. Find more at www.forgottenbooks.com This book is a reproduction of an important historical work. Forgotten Books uses state-of-the-art technology to digitally reconstruct the work, preserving the original format whilst repairing imperfections present in the aged copy. In rare cases, an imperfection in the original, such as a blemish or missing page, may be replicated in our edition. We do, however, repair the vast majority of imperfections successfully; any imperfections that remain are intentionally left to preserve the state of such historical works.